delivered, the outputs are in accordance with the requirements of EN 61000-4-5 Table 2.
powering the equipment under test, with an insertion tolerance of ±10%. In tolerance to 500V. Floating outputs allow use of a CDN for powered testing (not included). Certificate. One year warranty. One year calibration cycle. 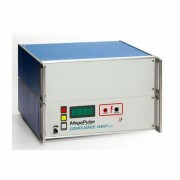 Combination wave Surge Tester for use in various power line tests where a high-current 7000V combination wave is needed. Built to the requirements of EN 61000-4-5, Section 6, Para. 6.1.1, except tester impedance. In compliance with tolerances noted in EN 61000-4-5 Table 2, except current output level. Positive and negative waveform delivery. Choose via a front panel button. 7000V/1400A combination waveform output maximum. In tolerance down to 500V/100A. 360º pulse insertion - pulse is applied at the point selected on the AC power waveform. Designed for use with a CDN. Heavy duty construction prevents overheating in repeated powerline test applications. Available options allow computer pulse control. Voltage waveform 1.2 uSec rise, 50 uSec duration, up to 7kV. Current waveform 8 uSec rise, 20 uSec duration, up to 1400A. Tester internal impedance is 5 ohms.